unweaving :: soul-sucking, originally uploaded by earthchick. Oh, it hurts, people. 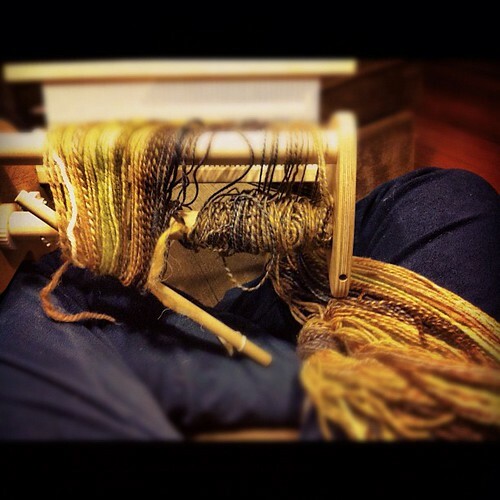 I’ve been trying to unweave this so I could re-do the warp, which I had done poorly and unevenly. I finally got the weft all unwoven, and when I got to the end/beginning, where I’d tied the warp onto the back beam, I discovered an unholy mess. What happened here? I don’t know, but it nearly defeated me. I spent an hour or so dealing with it, and I *think* I got it all sorted out. I wouldn’t have done it if it weren’t handspun, in a colorway I adore. I still have hopes that I can weave a reasonably good-looking scarf out of this mess…. Oh! I may have just made a loud, involuntary gasp and clapped my hands over my mouth at that picture. Now people at work are looking at me funny. I hope you get it all sorted out! oh MAN. that looks so sad.